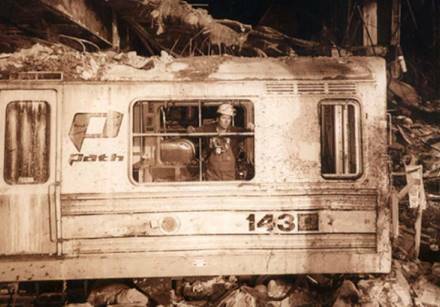 Ground Zero survivor PATH 143 comes to TMNY! We need funds to firstly pay for the car's shipping, secondly to develop a new 9-11 memorial exhibit with 143 as the centerpiece. Check out our fundraiser at GoFundMe! We depend on people like you to support the museum now and into the future. The rev­e­nue from just admissions and the gift shop isn't enough to sustain both regular op­er­a­tions and museum growth. There are many pro­jects, both large and small, that need ad­di­tion­al funding to carry them out. Chief among these are trolley and subway car res­to­ra­tion, expansion and re­ha­bil­i­tation of track, in­stal­lation of over­head electric wire, and equip­ment maintenance. Your tax-​de­duct­ible donation will provide vital support! Pay your dues or make donations instantly and safely by clicking the buttons below. If you prefer to pay by check, print and mail this form: tmnymemberform.pdf. Our highest visibility campaigns are run through GoFundMe to gain the maximum social media exposure. Its still just as safe to donate through GoFundMe and you have the option to be completly anonymous if you wish. Corporate Sponsors Are you the owner or manager of a business? Donate $200 or more to be listed on the Corporate Sponsor Board. Please contact the museum by calling 845-​331-3399 or e-mail for sponsorship details. Additional B2B opportunities are listed here. General Fund Your donation will be used where it is most needed. Electrification Fund Help support the electrification of the trolley line. Car Restoration Fund Support the restoration of the trolleys and subway cars. PATH 143 & 9-11 Memorial Fund Car 143, a survivor of the attack on the World Trade Center, will be the center of a new exhibit to remember the events of 9-11. IND R-4 825 Restoration Fund Primary restoration work on our Arnine car begins this year. Why not donate to help kick start the effort? PCC 1000 Restoration Fund The B&QT Clark-built PCC is listed on the New York State Historic Register. Help us restore this unique car! R-16 6398 Restoration Fund The R-16 is actively being restored by volunteers. Please donate to support the restoration.